PG and Rose with their 17 children in 1936 – (Standing left to right) Irene, Gerry, Mary, Tittu, Bullu, Otty (Seated 1st row left to right) Tilly, Alphy, PG, Rose with Blanche in her arms, Noel, Louise, Sonny, (Seated 2nd row left to right) Gussy, Tony, Corinne, Joey and Xavy. An unrelentingly dark book that throws little light on life beyond the author’s own tragic world is a slim volume called From Roses to Ashes (published by Akshaya). Weekends at the Madras Gymkhana Club, summer holidays in Ooty, the best schools and colleges to study in… Anna obviously grew up very privileged. Then there seems to have been a reversal of fortune and her father’s business began to fail. Anna went to work in an advertising agency, met a young man there she fell in love with, and married him although they came from different communities. The difference in their ‘castes’ was to haunt her forever after. Anna’s life seems to have been on a downward swing thereafter. She lays bare her marital and other troubles with a sort of careful candidness, as if to tell the reader not to make the same mistakes in life as she has done. She speaks of her possessive nature towards her husband and her two sons, of the almost irritating involvement she had with her children’s real and imagined ailments, of the cruelties she inflicted on her children because of her own frustrations and the guilt she felt because of this. She details the financial disasters in her life and the many unwise financial decisions she made. And then occurred the final disaster of her life, the death of her elder son. What the author hopes to achieve by her almost self-flagellating confessions, is difficult to understand. 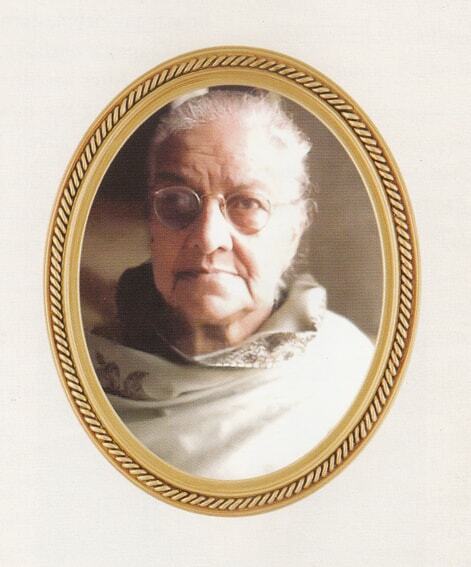 A complete contrast is the biography of Rose D’Souza. It is full of the joy of living and rich with a wealth of detail about Catholic life in Bangalore in the early 1900s. Rose, born in 1890, lost her mother early and, later, her father too. But she was lucky in having a fond stepmother who looked after her and her siblings with great care despite straitened financial circumstances. Rose was sent to school in Good Shepherd, Poona, as a boarder. “I saw my first motor car in Poona,” Rose recollects in one of her journals. “When we were at home at 2 pm, a black noisy conveyance would go on the road – it was a wonder to see it going without any animal pulling it.” Rose returned to Bangalore when she was 16 and her stepmother decided that she was ready to be married. The man she married had known to the family from when Rose was a baby. Peter George D’Souza was a lawyer in the Mysore Civil Service. When the matter of Rose’s marriage came up he offered to marry her. Although he was 30 to Rose’s 15, they seemed to think nothing of it and were engaged for five years before getting married. One of Rose’s grandchildren recalls, “Granny Rose was married in September 1910 and for a while there was no sign of the expected ‘good news’. As the first months went by uneventfully, Grandpa PG tried to console her by attributing the delay to the fact that he was already well past 35 years of age! How wrong he was, as time – and a fervent and effective novena they both made to St. Francis of Assissi – would soon tell! Their first born, Tilly, came in October 1911 and then in double quick time was followed by Sonny, Gerry, Mary, Bullu, Tittu, Irene, Otty, Xavy, Gussie, Tony, Joey, Alphy, Corinne, Noel, Louise, and Blanche – 17 children in all in the space of 25 years! That is not counting the eighteenth which was a miscarriage! In the foreword to the book, her grandchildren remark, “ ’Oh you are related to Mrs. P.G. 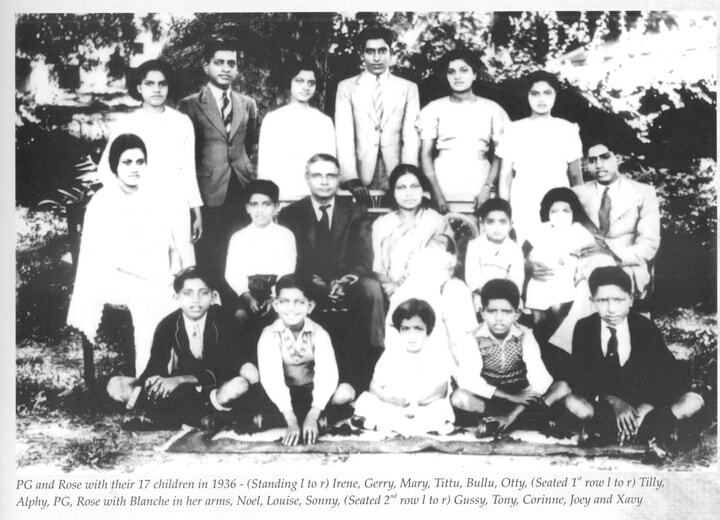 D’Souza, the lady with the 17 children?’ It’s a question that many of Rose D’Souza’s descendants across Bangalore, Mangalore, Chennai, Mumbai, Delhi… even London, and San Francisco, have answered over the years with a proud, ‘Yes’.” Granny Rose’s seventeen were born without ceremony in the double bed at home with the midwife in attendance. One child alone arrived prematurely at an inspection bungalow in Hassan where the couple had travelled. It was a normal delivery and the baby was swathed in cotton wool, the only incubating material to be found in Hassan. What is refreshing is the sheer gusto with which Rose embraced every happy event or moment in her life, every opportunity by which she could help someone other than the members of her own family, every bit of travel to widen her horizons (she also became an avid photographer, an unusual hobby for the women of those times), and was seriously into social work. There are some beautiful sepia tinted photographs in this very well designed book, that feature Rose’s entire family, all seventeen of her children included. She was very proud of her large family, and sometime in the early 1950s, when Cheaper by the Dozen, the American comedy about a couple with a large family was promoted in Bangalore, a contest was sponsored for ‘The biggest and the best family’ in the city, open to families of a dozen or more. One of her sons, Tony, told Rose about it as a joke. She promptly entered the contest and, of course, won. Although the children were totally embarrassed by the whole thing, Rose roped in at least some of them for the prize giving function at the Theatre. When Rose and her husband had more money, they bought not just a large home but a piece of history, Oorgaum House. Rose and her siblings had to trudge a long way to school and back when they were little. To rest on the way back, they stopped opposite a huge bungalow on Seshadri Road (later Grant Road). During rainy weather its low- lying grounds filled with water and Rose and her companions named the house the ‘Island House’. 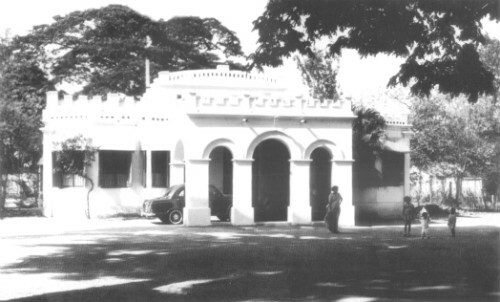 The house belonged to Lavelle, a Frenchman who discovered the gold mine in the Kolar Gold Fields, called Oorgaum Mine. The Maharaja of Mysore, so pleased with him, gave him about seven acres between Grant Road and Lavelle Road as a gift. Lavelle’s daughter Eliza married a horse trainer who named Lavelle’s house Ascot and built a huge number of stables in the grounds. Oorgaum House was actually a ballroom that Lavelle built to celebrate the homecoming of his son from England where he was working. When Lavelle died all his property was auctioned except for Ascot. It was Oorgaum House that Rose and D’Souza bought from an agent at Rs. 9,000. Later, when bits of Lavelle’s grounds were auctioned, they bought some more land and added it to their property. The couple had to take a bank loan to buy the house and a further loan to strengthen the building and add a pretty portico. The couple lived in this house until their passing and it became the base for their huge immediate family and, later, their equally huge extended family. (Their dining table could formally seat 24, but still needed to be used in shifts during holiday time!) Oorgaum House was also home to any number of orphans or destitutes whom Rose wished to help and often housed in the extensive quarters in the grounds. In 1959, after her husband died, with no one to attend to at home, as her children too had grown up and moved away, she got more actively involved in social service. When she died in 1986, her entire brood mourned her loss. Rose D’Souza. Precious memories. is an expression of love for a woman who gave so much of her love to the world. It’s also a lovely read.